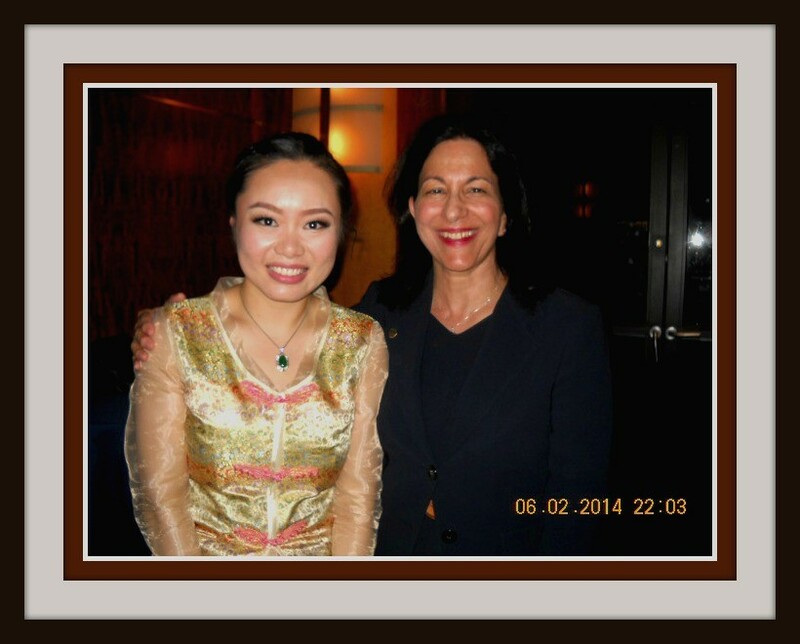 Guqin Performer, Jiaoyue Lyu, with Prof. Elise Sobol, Ed.D., Weill Recital Hall, Carnegie Hall, New York City, on June 2, 2014.
iaoyue Lyu, an accomplished Guqin artist and pianist, performed a Guqin concert of exquisite beauty, sensitivity and fine art on June 2nd, 2014, at Weill Recital Hall, Carnegie Hall, in New York City. Having studied and played piano since the age of four, she has won numerous awards in competitions throughout China and the world as a pianist. A scholar of high achievement as well, Jiaoyue entered the Nanjing Normal University in 2008 as a piano education major. Choosing a minor of Guqin, she studied under the highly celebrated Professor Xiaoqin Yao, famed Guqin and Chinese Cymbalo performer of the Meian School. Another major influence in her university training as a musician was Professor Gongliang Cheng, renowned Guqin artist and primary figure in the Meian School. Jiaoyue first began learning and playing Guqin in 2013 with Shih-Hua (Judy) Yeh, who performed with Jiaoyue as part of this exemplary ensemble on the evening of June 2nd. The Guqin, or Chinese 7-string zither with no bridges, is a fine classical musical instrument that is more than 3,000 years old. While “Gu” can be translated as meaning “ancient,” “qin” is now considered a generic term for all string instruments in China. Guqin has long been well-regarded as the favored instrument of sages and literati. Confucius was considered to be a Guqin grand master, as was notable Ji Kong, one of the “Seven Sages of the Bamboo Grove.” Playing the Guqin well is known to enrich the heart and empower the human spirit. As one of the traditional arts, Guqin performance is a vital symbol of high Chinese culture. In 2003, the United Nations Organization for Education, Science and Culture (UNESCO) registered Guqin as one of the master elements of the Oral and Intangible Heritage of global humanity. 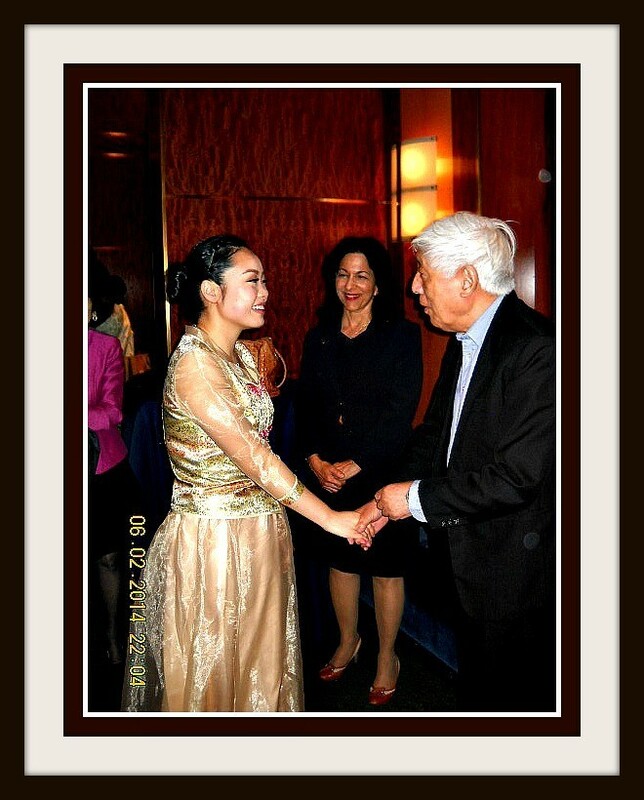 Jiaoyue Lyu greets highly acclaimed Musician, Artistic Director/Conductor Emeritus, Guojun Wu, at her Guqin Recital Reception, Weill Recital Hall, Carnegie Hall, on June 2, 2014. Guojun Wu, pictured above, is a highly esteemed musician who graduated from Shanghai Conservatory in 1955. As one of the founders of the elementary branch of the Shanghai Conservatory, he taught there for thirty-seven years. Many graduates of this conservatory are now famous vocalists, instrumentalists, composers and music educators. Professor Wu has arranged many well known and celebrated compositions for choral performance. Since 1992, he has been living in the US. He was Vice President of the New York Hua Xia Art Center as well as Artistic Advisor and guest conductor of Chicago Yellow River Chorus. He has been the conductor of Huaxia Chorus since 2001, and in November 2003, after Huaxia Chorus performed at NJIT, the dean awarded him a Life Achievement award. Ms. Lyu’s solo Guqin concert, Clear Moon Inspiring Rhyme Strings, was the first Guqin concert performed since the Nanjing Normal University was founded 110 years ago in China. This event received important media coverage and was included in the documented history of the university. At this time, she also participated in a major research project, assisting Professor Yao to complete the study entitled, the Significance of Introducing Guqin in Education into University General Education Curriculum, and served as co-author for a national level core journal. Jiaoyue has given solo concerts in China, playing both Guqin and piano. She has had Guqin concerts in the U.S. at the New York Mei An Qin School as well as the New York Qin Society, and she performed a Guqin and vocal solo at the Kodaly concert. Jiaoyue Lyu was invited to perform on Guqin at Lincoln Center, NYU Skirball Center, NYU Black Box and at many other performance venues. As a member of the NYU Jazz Choir and University Singer, she has performed in many concerts in the U.S. and abroad. She composed music for and performed Guqin with cello in the musical theater production, Witches Brew, along with other members of the Creative Performance Opportunity class at NYU. Subsequently, during the China Meets America Cultural Festival at Carnegie Hall in January 2014, she shared her many varied and astute talents as teaching assistant, interpreter, backstage director and MC. 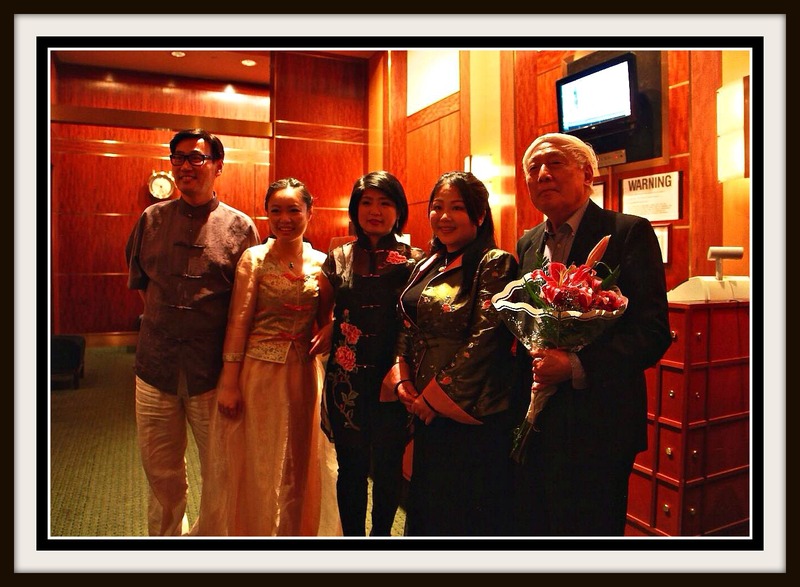 Guqin Concert Musicians Miao Yimin, Jiaoyue Lyu, Zhou Yi, Shih-Hua (Judy) Yeh and Guojun Wu, Serene Moon Concert, Weill Recital Hall, Carnegie Hall, New York, on June 2, 2014. Love of Phoenix is said to have been composed by Sima Xiangru to aid him in pursuing the affections of Zhuo Wenjun, the beauty of his dreams who he cannot forget, although she is not within sight. He describes himself in the song as “a male phoenix seeking the female, flying across sea by sea with no trail.” He declares that he would rather die than be refused her warmth and affection. After playing two Guqin songs, he succeeds in gaining her love. The now well-known Feng Qiu Huang is based on this love story. The lyrics of the songs originated in The Romance of West Chamber by Wang Shifu during the Yuan Dynasty. As one of the most popular small tunes, On Autumn Wind depicts a husband missing his youthful wife. The earliest version of this song includes On Autumn Wind by Li Bai and the Condor Hero, Louis Cha Leung-yung’s martial arts romance, which ends with this poignant, emotional poem. This well-known example of Qin music from 1931 has a title identical to that of Li Bai’s poem, also performed to this tune. When interpreted by excellent musicians, the audience feels and understands the profound longing of soldiers on the frontier for the comforts and familiarity of home and family. The version of this composition generally known today was transmitted by the qin player, Peng Zhiqing. This music became more easily accessible and playable for modern qin performers in 1937, when the journal of the Jinyu qinshe published the score with rhythmic indicators next to the tablature signs and additional gongche notation. Older versions of this piece are entitled, Remembering an Old Friend in the Mountains by Shan Zhong Yi Gu Ren, and Remembering an Old Friend in Mountain-Desolation by Kong Shan Yi Gu Ren. The complex and sensitive finger technique of this composition, its classic beauty of timbre and note ornamentation as well as its repetition of sung melodies serve to embody the continuous ebb and flow of thoughts and emotions. This composition originates in The Mystical Secret Guqin Pieces, thought to have been composed by Ruanji of the Kingdom of Wei during the era of the three kingdoms. On the pretense of experiencing temporary insanity caused by over-indulgence in liquor, the composer proclaims his objections and grievances concerning the cruelty and harsh nature of social reality during this period in history. This hauntingly beautiful music eulogizes the incorrigible qualities of plum blossoms, flowers that are known to survive frigid temperatures, frost and snowfall. This piece also celebrates men with noble sensitivity and emotions. According to legend, this music was first composed for bamboo flute solo by Huan Yi during the Jin Dynasty and later arranged for playing on Guqin. This music selection is rated as being among the Top Ten Chinese Classic Music compositions. Its form is pure classicism and its theme is one of peaceful beauty. Its depth of color and mood make this an historical statement in Chinese music composition. Thematically, the overall setting of the river in moonlight is vividly depicted and expressed through the music. The flowing water transporting spring will pass by, and the distance between southern rivers and eastern oceans is vast. Yet the moonlit scene will long be remembered for its essence of calm serenity and elegance. With its repetition of two-note chords, this meditative music radiates an ambiance of reverence, continuity and peace. The listener can easily be transported to the interior of an age-old Buddhist temple. Having first surfaced in Sanjiao tongsheng qinpu in 1592, the tablature and essence of this composition were also known as Shi Tang Zhang. This profound piece of music is essentially based on the famed literary masterpiece of the same name by Tao Yuanming during the Eastern Jin Dynasty. It depicts his life of seclusion in the country following resignation. He subtly reveals the shortcomings of his career as an official and displays his life-long philosophy of accepting nature’s course and being content with his own life and circumstances. In Song for A Beauty, the Han Dynasty musician, Li Yannian, extols the extreme beauty, virtues and powers of his sister for the purpose of convincing the Emperor of her excellent value. She subsequently is chosen as the Emperor’s third favorite concubine. The Yue Folk’s Song by Chu Ci is the first known inter-lingually translated poem. In the poem, a female sailor from Yue falls in love with Zixi from Er. When she sings a song for him in her local tongue, he has it translated into the Chu language. Zixi then reads the poem and falls in love with her. Willows are green before the tavern. 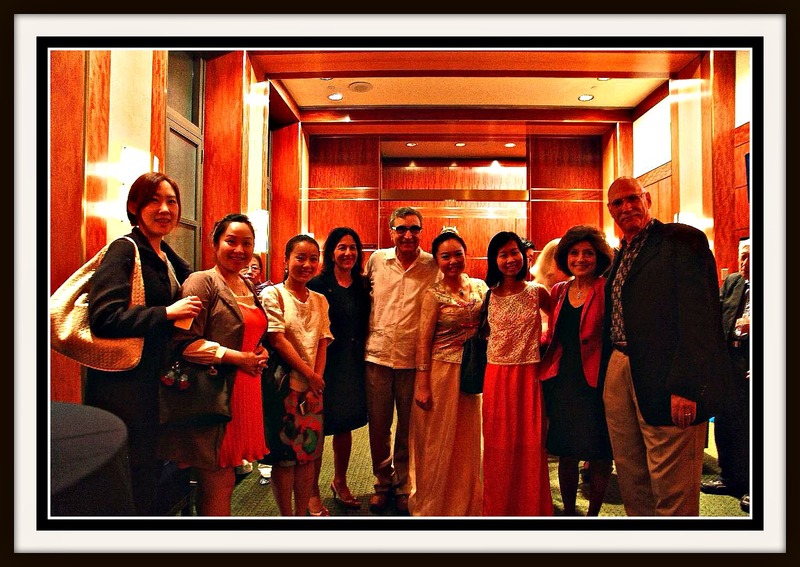 Guqin Recital Performing Artist, Jiaoyue Lyu, with Friends and her Professors from New York University at her Weill Hall Recital, Serene Moon, at Carnegie Hall, New York, on June 2, 2014. Zhou Yi, pipa virtuoso, has won high praise for her outstanding technique and ultimate heights of expressive playing. She began her music studies at the age of five and now is highly accomplished at playing pipa, guqin, liuqin, ruan, sanxian and piano. Since graduating from the Shanghai Conservatory of Music, her solo concert performances have included Tan Dun’s Concerto for Pipa and String Orchestra at the Gewandhaus in Leipzig, Germany; Young People’s Concert with the New York Philharmonic; Bun-Ching Lam’s Pipa Concerto, Song of the Pipa; and Tan Dun’s Map in NYU’s 2014 Vision and Voices Series. Zhou collaborated with Damon Albarn (Gorillaz/Blur) in the premiere show at Spoleto Festival, Monkey: Journey To The West. She also recorded the music for David Henry Hwang’s Off-Broadway productions of The Dance and the Railroad and Kung Fu (The Bruce Lee Story). Ms. Yi has also produced a show that was a pioneer production merging the essence and spirit of Eastern music with Western jazz modes and forms, creating a unique music hybrid. Miao Yimin, internationally acclaimed Chinese woodwind virtuoso, is founder of the Ba Ban Chinese Music Society of New York. At the age of nine, he began private dizi studies with China’s most highly honored musician, Mr. Yu Xunfa. Subsequently, Miao acquired membership in the Chinese Musicians’ Association. This distinguished group is an organization within the International Music Committee (IMC), a part of UNESCO. He has been a flutist with the globally celebrated Shanghai Traditional Orchestra and Jinan Traditional Orchestra of Shangdong province, China. In New York, he has performed at Carnegie Hall, Lincoln Center and the Metropolitan Museum of Art. He has lectured and led workshops at Yale University, Cornell University and New York University. As a highly accomplished and versatile musician, Mr. Yimin is a virtuoso player of the dizi (bamboo flute), xiao (notched flute), koudi (whistle flute), hulusi (gourd-shaped flute), bawu (free-reeded flute) and xun (ocarina). Miao utilizes his extensive knowledge of both classical and contemporary music to produce his astute interpretations, exquisite subtlety of tone and virtuosity of technique. Shih-Hua (Judy) Yeh, acclaimed Guqin and Guzheng Master, is both Founder and Director of the Taiwanese Music Ensemble of New York. She is also Founder of the New York Guqin School. Shih-Hua has specialized in playing professional concert performances on many varied Chinese musical instruments. She is a highly respected music educator and was named an official judge of music examinations by the China Conservatory of Music and Chinese Music Organization in 2011. She has also been a lecturer of the Jinwen University of Science and Technology in Taipei. Ms. Yeh graduated from the Taipei National University of the Art (TNUA) with a Guqin Major. She later earned her Master’s degree in Ethnomusicology from Sheffield University in the UK. Shih-Hua (Judy) is a member of Water Stage Ensemble based at TNUA and has performed both nationally and internationally. She has won numerous awards in distinguished Chinese music events. She has been invited to perform at such highly honored and respected professional venues as Lincoln Center, Merkin Hall and Weill Recital Hall, Carnegie Hall. Attending a concert of Serene Moon, a beautifully sensitive and mesmerizing virtuoso Guqin performance by Jiaoyue Lyu and her acclaimed ensemble of musicians—all Chinese instrument players of ultimate quality and accomplishment—is a breathtaking and enlightening experience not to be missed. All music lovers will rejoice at the opportunity of being very fortunate and privileged audience members at one of Jiaoyue Lyu’s future Guqin concerts in New York or at venues throughout the U.S. and worldwide. This article was written with detailed input from Jiaoyue Lyu’s Serene Moon Guqin Recital program notes and from Professor Elise S. Sobol, Ed.D., NYSSMA Chair, Music for Special Learners; Author: An Attitude and Approach for Teaching Music to Special Learners; Faculty Affiliations: NYU, C.W. Post/Long Island University; Nassau BOCES Department of Special Education. 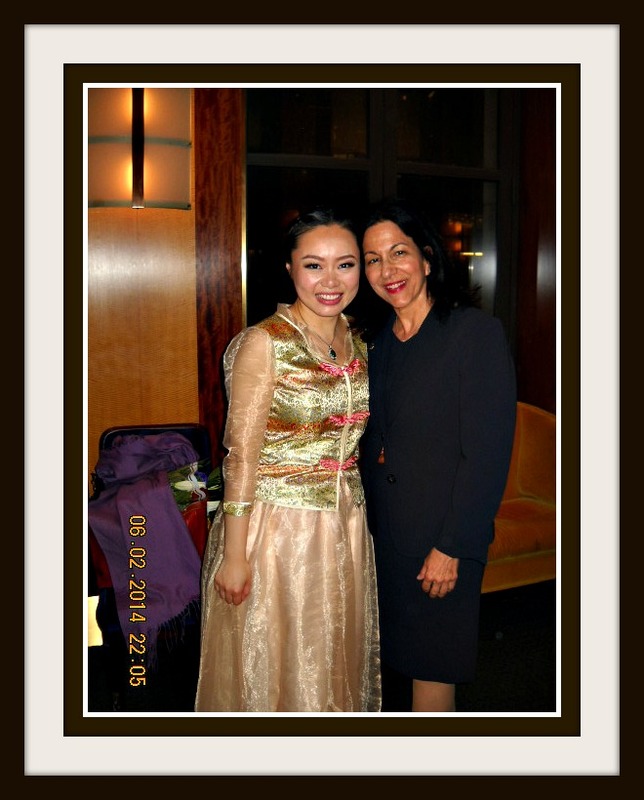 Jiaoyue Lyu and Prof. Elise Sobol , Ed.D., at Ms. Lyu’s Weill Hall Guqin Recital, Carnegie Hall, New York City, June 2, 2014.